Hi, I'm Rosie a female Red Kangaroo. Even though I'm a Red Kangaroo my fur is a bluish colour - so some people call me a 'blue flier'. My husband 'Boomer' is red. He's the biggest of all kangaroos. He measures 79 inches (200cm) from the tip of his nose to the end of his tail and weighs 198 pounds (90kg). I'm a bit smaller. I'm a marsupial mammal. That means I have a pouch on the lower part of my stomach to carry my baby. Inside my pouch are four teats for my baby to feed on. My baby's name is Joey. All baby kangaroos are called Joey. Luckily I can recognise my Joey in a crowd. When I sense danger I warn him by stamping my foot and he hops back into my pouch. I have long pointed ears, small front legs, strong back legs with long feet, and a long powerful tail. My tail is very useful. It helps me to balance when I'm hopping and leaping and I lean on it when I'm sitting or kicking with both rear feet. Instead of walking or running I hop at speeds up to 37 miles an hour (60km). I can leap over large objects. I like to sleep out in the open but on really hot days I lie in the shade of a tree and lick my fur to keep cool. If I have enough green grass to eat I don't have to drink water. I usually stay in one area, but if there is a drought I travel up to 120 miles (193km) looking for food. Boomer and I like company and live in a mob of 80 Kangaroos. I have many different relatives and one cousin likes to live in a tree. He's called a Tree-Kangaroo. 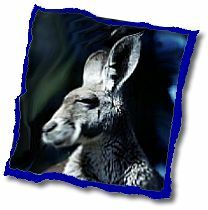 The Aboriginals of Australia tell many stories about us kangaroos.